On the eve of our first Neo-Pleistocene summer, carbon barons David and Charles Koch seem to be everywhere. That last—an entire city-block of petroleum coke, a waste byproduct of refining Canadian oil sands—is also the dirtiest public face of the Kochs. But like any savvy corporate sponsor, they’re scrubbing it with philanthropy to present a clean, enlightened face, like the one greeting you at New York’s Metropolitan Museum of Art, where large signs tell you you’re standing on “the site of the new David H. Koch Plaza.” Originally the $65 million Dave gave to redo the plaza and fountains wasn’t going to result in naming rights, but somehow it did. And because of a $100 million donation, for the last five years you no longer attend the city ballet or opera at the New York State Theater at Lincoln Center but at the David H. Koch Theater. The Kochs are hardly the only .1 percenters whose wealth can make us hold our tongues and put aside our best-laid plans. But the brothers’ money, coming from the conglomerate Koch Industries, the nation’s second largest privately held company and fifth-largest air polluter (with businesses in oil, gas, chemicals, tar sand, pipelines and paper), casts longer shadows than your average oligarch’s. Their wealth not only feeds a giant “Kochtopus” whose tentacles in think tanks, foundations, and Congress are strangling climate policy (see these Democracy Now! videos explaining how the Kochs may be the single “biggest force behind the climate stalemate”). 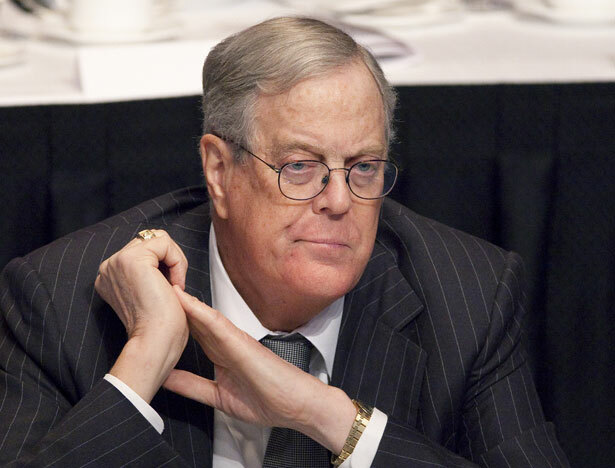 But Koch money is even choking dissent from a respected indie-film funder, Independent Television Service (ITVS), that “prides itself on its resistance to outside pressure,” as Mayer puts it. Her New Yorker story on the Koch Effect on two documentaries in ITVS’s popular Independent Lens series, details how plutocratic wealth deforms the space around it, even when no one wants it to. The first doc, “Park Avenue: Money, Power, and the American Dream,” contrasts the lives of the fabulously wealthy residents at one end of Manhattan’s Park Avenue, most prominently David Koch, with those of working poor families at the other end. When PBS first aired it last November, Koch was on the board of PBS’s New York station WNET and was planning to make a “seven-figure” donation. The Alex Gibney film is critical of Koch (noting, for instance, that his “company had to pay what was then ‘the largest civil penalty in the E.P.A.’s history’ for its role in more than thirty oil spills in 2000,” as Mayer writes). When WNET president Neal Shapiro learned how critical, he tried to placate Koch, in part by letting Koch Industries issue a statement knocking the film immediately after it ran, a move “spokespeople at WNET and PBS conceded…was unprecedented,” Mayer writes. “Indeed, it was like appending Letters to the Editor to a front-page article.” Shapiro was so “livid” at ITVS that he threatened to stop carrying its films. Another source said ITVS executives had urged Lessin and Deal to drop the Koch name from the title, de-emphasize their politics, and cut a scene with Sarah Palin at a rally sponsored by the Kochs’ Tea Party-funding, tax-exempt “social welfare” organization, Americans for Prosperity. At one point an ITVS vice-president spelled it out: “We live in a world where we have to be aware that people with power have power.” ITVS cancelled the project in April. But being a benefactor isn’t contrary to influence, it is influence. That’s how self-censorship—the most enduring form of censorship—works. And in the end, Koch openly did exert influence—he resigned from WNET’s board, on May 16, and took his money with him, thus activating the threat latent in all corporate sponsorship. Tracing big money’s influence, direct or indirect, isn’t always as clear as it is in the WNET/ITVS case. It’s usually murky. But the question is, what activities will humans, like him, take to fight it? And on that, Christie affects boredom, if not belligerence. There’s also no proof that Koch influence—like David Koch having a chummy meeting with Christie and inviting him to be the keynote speaker at a super-exclusive Koch confab near Vail—“caused” climate-change believer Christie to suddenly pull out of a regional pact to curb greenhouse gas emissions in 2011. But that’s the nature of influence—it’s like climate change itself: You can’t always prove with spreadsheet certainty that it caused any one event—a cancelled documentary, a gubernatorial 180, a filibuster, an election result. We do know, however, that money in politics and global warming are both man-made disasters that we’ve let get completely out of hand. And if we stop the former, we might be able to slow the latter. Read Katrina vanden Heuvel on the new film Koch Brothers Exposed.